The Delaware River where it forms the boundary between Sussex County, New Jersey, and Pike County, Pennsylvania is a Wild and Scenic River, declared so by President Jimmy Carter more than 30 years ago. That part of New Jersey that borders the river here is just as wild and scenic, technically a recreation area under the supervision of the National Park Service, but unmarred by any of the trappings of recreation areas. It is here that a tributary of the Delaware called Flat Brook and its tributary, Little Flat Brook, form a narrow but lush vale called Walpack Valley. 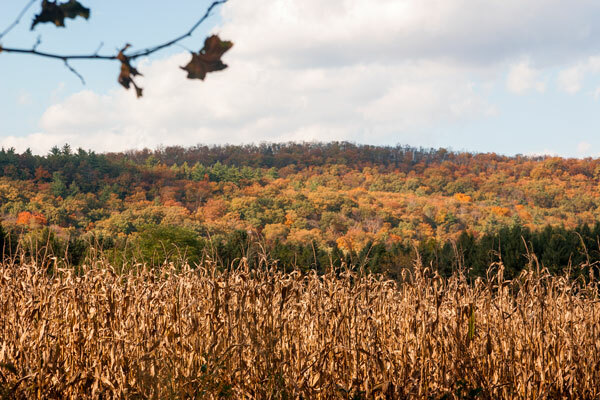 Walpack Valley is exquisite any time of the year but reaches its peak in the fall. 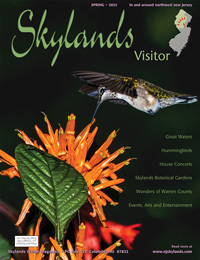 To get to this Skylands Eden, drive on Route 206 north (towards Pennsylvania) past Culvers Lake. 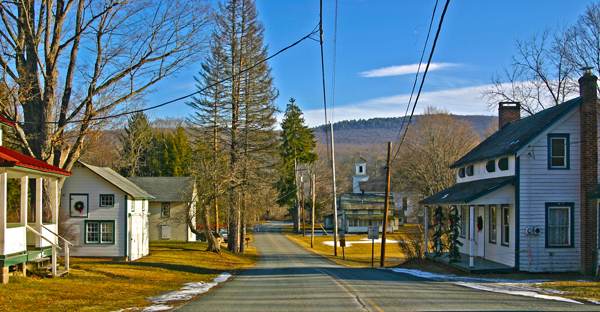 A mile beyond the lake, at a place called Tuttles Corner, Route 560 branches off to the left. Benjamin Tuttle had a fine hotel here in bygone years. It's a sign of the times that Rosie's Restaurant and Pizzeria now sits at this intersection. A sign here points to Layton, about a mile down the road. The village of Layton, originally called Centreville, is the canterpiece of a township over 230 years old. Indeed, the Old Mine Road or River Road which passes close by was built by Dutch miners sometime around 1650. As you enter Layton, a red school house can be seen on the right, antiques having replaced the "Three Rs" as the principal activity. Further on, the Layton Hotel, built around 1850, stands by the roadside. 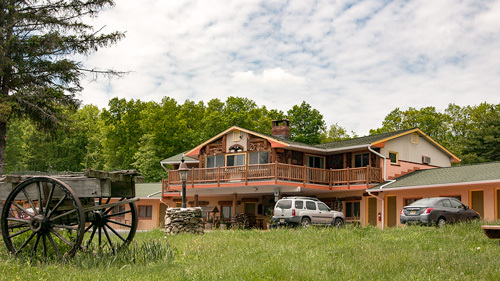 The Squashic family, Frank, Mary Ann, Steve and Marie, still welcome the hungry traveler, or thirsty trout fishermen from adjacent Little Flatbrook. At the crossroads, the Layton General Store stands guard, a relative newcomer, built in 1902 to replace one that burned. The owners, Ralph and Gillian Harriot, would prefer you to "Chew Mail Pouch Tobacco", or so the lettering occupying the entire south wall of the building would indicate. At this intersection, continue straight ahead, now on Route 640 which will soon become Route 615. The road parallels Little Flat Brook which will soon join the Big Flat Brook, the two streams producing some of the finest trout fishing in our state. A few minutes drive will bring you to a little settlement blessed with a variety of names in the past--The Corners, Bevans, Hens Foot Corner--but has now achieved its greatest acclaim as Peters Valley. The community probably came into its own in 1838 when a Dutch Reformed Church and cemetery were built here. Both still stand, in good condition. But today Peters Valley is widely known as a craft center where a wide selection of craftsmen teach their art and display their work. From blacksmithing and ceramics to wood and metal working, to photography, weaving, and more, some 20 buildings are devoted to the arts, either as housing for artists in residence, dormitories for students, or workshops for artists and craftsmen. Additional facilities have been constructed at Thunder Mountain, about two miles down a country road from the village. Thunder Mountain is sited atop a hill, surrounded by fields, and overlooking a small lake. Peters Valley Craft Center administers the old village structures including an interesting Greek Revival home built in 1850, as well as the new Thunder Mountain location, under special permit from the National Park Service. The high point of the Peters Valley year is the craft fair, held each fall at the Sussex County Fairgrounds. Here, over 150 juried craftspeople sell their work. In addition, craft demonstrations, live music and good food make this a memorable event. Continue on Route 615--you'll pass the old church as you leave the village--and drive for several miles through the Roy Wildlife Management Area, and then enter open country and the environs of Walpack Center. Walpack Center was once a thriving farming community with a post office, general store, church and a few homes. These buildings are still maintained and some are occupied. If you desire a little side trip, turn left at the Wallpack (sic) Post office, cross the Flat Brook on an ancient and narrow bridge, you'll soon come to an intersection; go straight ahead here a few hundred feet and you'll come to the beautiful Tillman Ravine. You can park and stretch your legs on a trail at the Ravine; or turn right at that intersection and you'll be in front of the old Walpack Cemetery, well-kept and pleasant to walk through. 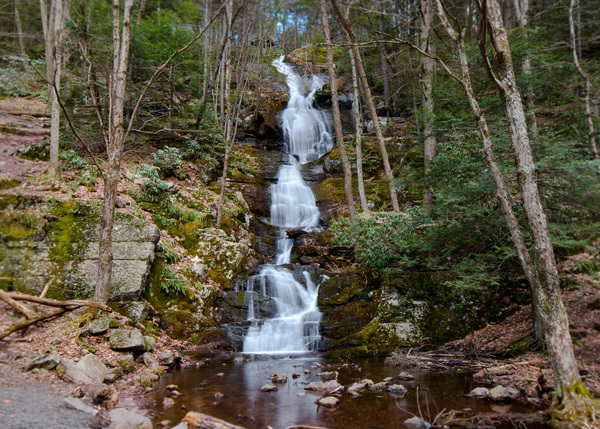 If you proceed past the cemetery down the somewhat bumpy dirt road about two miles, you'll come to Buttermilk Falls--some call it the Yosemite of Sussex County--right there on your left. There are trails to the top of the falls which you can walk if you feel the need to exercise. Or you can walk it from the cemetery if your car has weak springs. 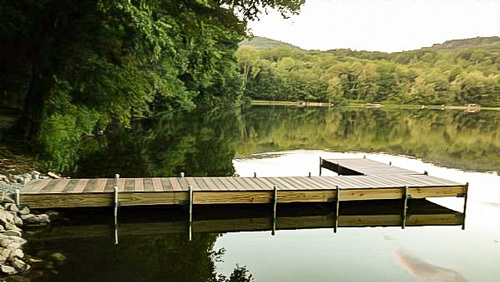 After you've completed one or both of these interesting side trips, retrace your steps, back over the narrow bridge, through Walpack Center to Route 615 and turn left. You'll come almost immediatley to the Walpack Valley Environmental Center, a great place to stop, and then further on, a Ranger Station in a restored stone farmhouse worth looking into. All of these places have bathrooms, if needed. Continuing on, The Walpack Inn appears on your left, a restaurant well-known to diners in the northwestern part of the state. If you choose to drop in, you may get to see a bear on the roof, a rare but not unknown occurence. You'll next pass the Walpack Valley Campground and then you'll come to a fork in the road. Keep Left. The rest of the route is a loop; you'll reappear later at this intersection on the other branch of this fork. From here the road again hugs the Flat Brook on the left, shaded and heavily treed. There's great canoeing all through here when there is sufficient water in the brook. Continuing on you'll come to a bridge over the brook which if followed brings you to restored Mill Brook Village over the county line in Warren County. A trip here should probably be saved for another day. Continuing on Route 615 you enter another ancient village called Flatbrookville located on the Delaware River. The homes seem to be nicely maintained, some undoubtedly leased by the National Park Service. Continuing on you'll come to the Rosenkrans homestead. For generations this family operated a ferry here on the Delaware before the coming of bridges. It is now private property. Continuing around the loop the Delaware will be on your left, now a wild and scenic river, and it looks it. The road we are on is part of the ancient Old Mine Road. We'll soon complete the loop and come out at the intersection near the campground. We'll retrace our steps back past Walpack Inn, Walpack Center, Peters Valley, to Layton. Entering the intersection with the Layton store in front of us let's take another delightful side trip, this one to the Dingman's Ferry bridge. It would be a shame to miss it after getting this close. As you approach the river, a road crosses. This is more of the Old Mine Road, now paved and still serviceable. To your front is Dingmans Bridge, the only privately owned bridge crossing the Delaware. This sound but antique structure was bought second-hand at the turn of the century, moved from the Susquehanna River and reerected here. It has survived the worst flood in the river's history, that of 1955, and is perfectly safe. Cross it if you will, but if you cross now you'll pay a toll going and another toll if you attempt to return. There is a canoe livery at the Pennsylvania shore (Dingmans Ferry) and another upriver on Pennsylvania Route 209 at Matamoras. A canoe trip downstream passes through one of the most interesting sections of the river and is a great way to see the fall folliage. This is the portion of the river declared Wild and Scenic and you'll soon see why. Bald eagles, hawks, even an occasional black bear are sometimes in view. The river itself, in this area, is free of intimidating rapids and provides a fine afternoon's jaunt. To visit the area described here will certainly take at least a full day, or if you take it easy, could provided two or three pleasant sojurns. But when you are ready to call it a day getting home again is uncomplicated. If you're on the Pennsylvania side of the river, you can simply take Route 209 south to the Delaware Water Gap, then go east on Interstate 80. If you're in the Walpack Valley area retrace you're steps: go to Layton and get on Route 560 and follow it east to Route 206 at Tuttles Corner. A right on 206 will take you into Sussex County, past Culver's Lake towards Newton. 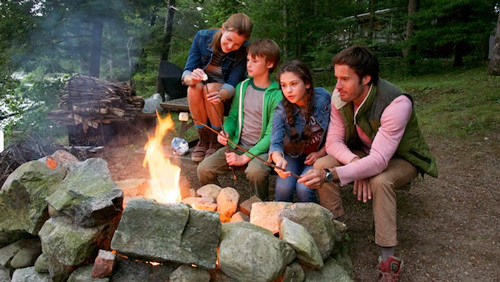 Either way, the trip will provide you with a memorable experience, an adventure in the Skyland's wild and scenic wilderness. Frank Dale is known for his portraits of places of historical note in northwest New Jersey.